11892 Goldring Rd,Arcadia, CA 91006, USA. Maximize system speed by adding First Cable Line’s new SSD performance! 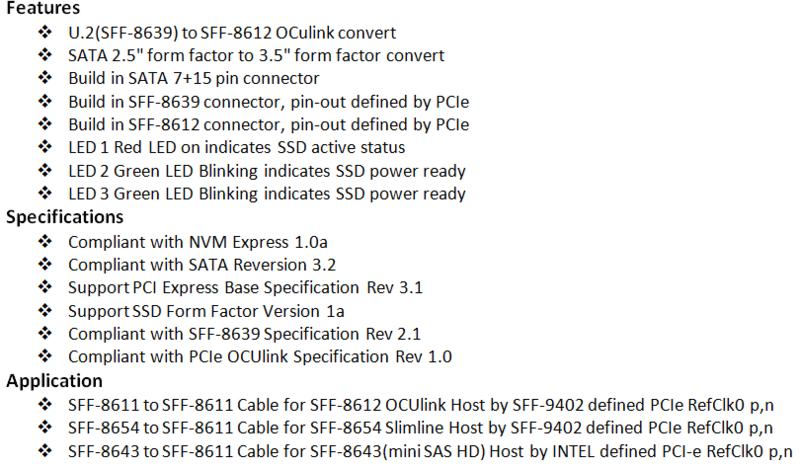 Our new product, Oculink (SFF-8612) & SATA to 2.5″ U.S SSD Adapter, is ideal for professionals and enthusiasts who are building or upgrading a computer or server solution. First Cable Line, Inc. (FCL) provides a complete full turnkey manufacturing service from custom cables to complete selection of standardized cables and accessories stocked in its Arcadia facility in Southern California. Our global location of facilities in three different countries allows us the geographic advantage to serve our customers. At FCL, we’re prepared to respond quickly on providing detailed quotation, product cost down, design improvements, on time production, and improving time to market delivery.